This is one of the quickest posts I will ever write. My Mum and brother have just left and it's pretty lonely around here as my roommates are not home. I'll recap the events of this week another time, as I just wanted to pop in and share this salad with you. Then I'm off to have an early night, catch up on some tv and get some much needed rest before I tackle my last load of assignments for the school year. I've got a hectic few weeks before I finish (4 weeks left of this year). It's very simple and probably a combination you have seen of or heard before. My salad was definitely inspired by Iowa Girl Eat's Inner Goddess Detox Salad. I absolutely love her. She has fantastic and relatively easy recipes. The reason why this salad is so great is because it is so simple - you literally toss the ingredients together, throw together a quick, sweet dressing and you are good to go. The ingredients are simple - you probably already have them all. 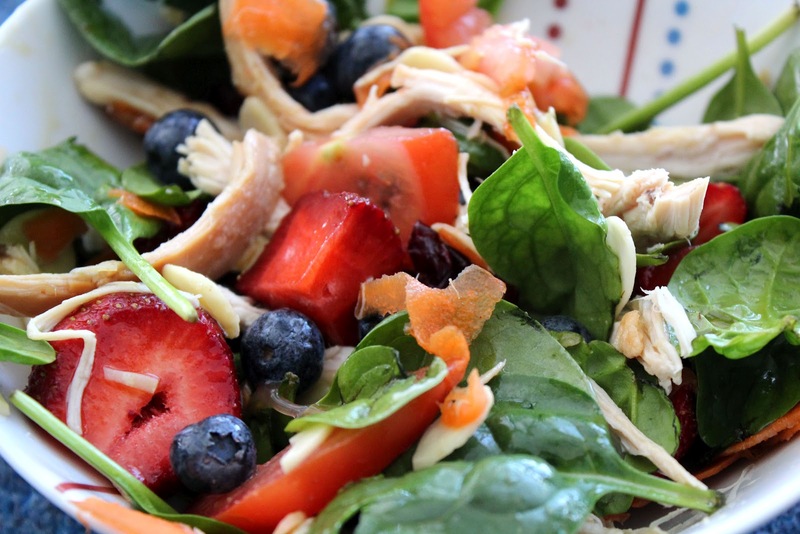 There is nothing more like summer than the combination of sweet strawberries, tart blueberries, and tender chicken, drizzled in honey-esque sauce. 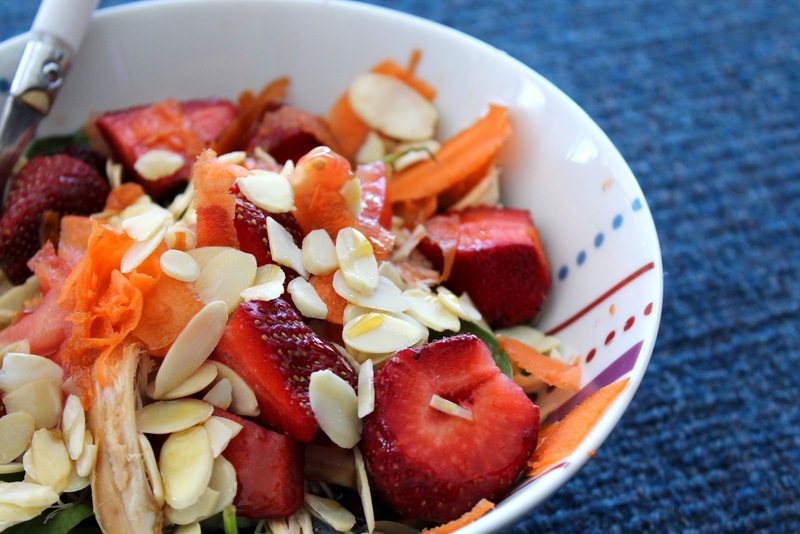 So get your ingredients ready and make yourself this nutritious, healthy and delicious salad. Right now. C'mon, you know you want to. Occasion: Lunch – definitely a picnic-style meal. This would also make a simple and light dinner. 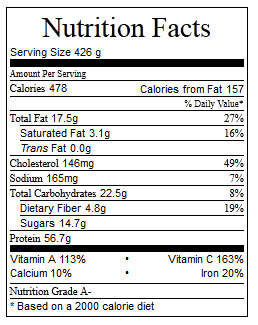 Menu Options: You could add other summer fruits if you like – apple and pear would make a lovely addition to this meal. You could use other greens – rocket, kale, iceburg or a mix of lettuces would suffice. You could add any other fruits and veggies you like, but remember the dressing has a honey base, so sweeter foods work with this dish. 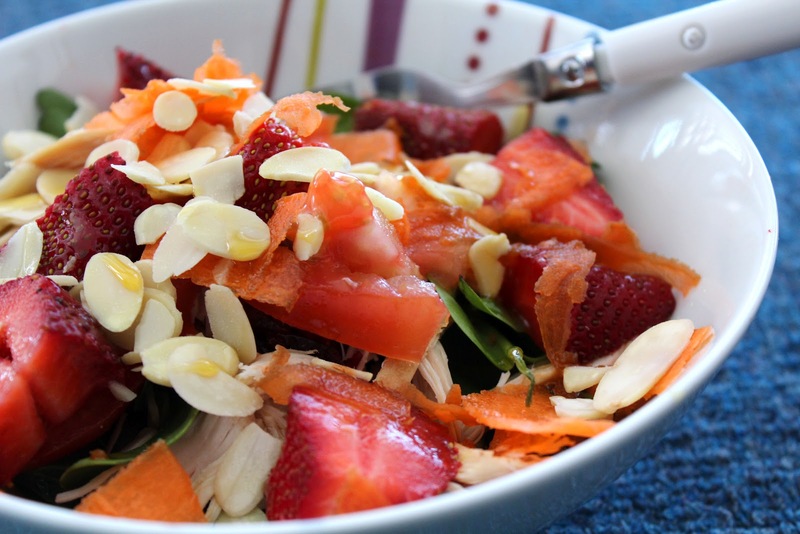 In a bowl, combine chicken, berries, spinach, tomato and carrot. Make the dressing. In a smaller bowl, combine honey, oil, balsamic vinegar and water until they make a thin dressing. If you want, add more honey for a stronger taste. Toss the salad in the dressing and top with flaked almonds. Serve cold. Yum this looks soo good! Love how perfect your photos look! I have only just started putting fruit in salads and it is so amazing! Thanks for sharing - I always love a good "throw everything in a bowl and mix" type recipes! Will have to try this one weeknight when I don't feel like turning my stove on! Yeah it was pretty much a salad that came about in an attempt to use up random ingredients in the fridge haha.